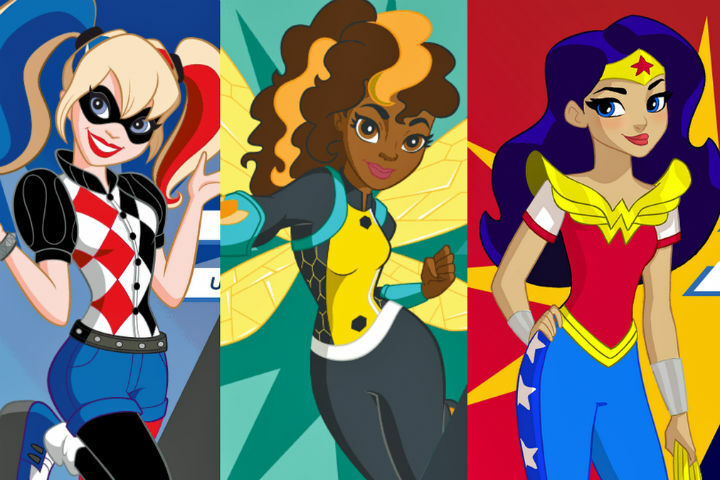 DC’s finally launched its new girl-oriented initiative, “DC Super Hero Girls,” with the website and several episodes of the series online. The series’ premise is basically “Sky High” meets “Tiny Toon Adventures”: various classic DC heroes and heroines enroll as students at “Super Hero High” to learn all they can about being great heroes. The school is run by a New 52-esque-skinny Amanda Waller as the principal, while someone who looks like Grodd(?) is a faculty member. Fortunately, it looks like the faculty’s not all anti-heroes/villains: Red Tornado’s also shown in a few clips. The core cast consists of Wonder Woman (yes, they’re keeping everyone’s names despite being teenagers—so she’s not Wonder Girl), Hawkgirl, Miss Martian, Starfire, Harley Quinn, Bumblebee, Batgirl, Supergirl, Katana, and Poison Ivy. Hal Jordan and Beast Boy are the main boys in the cast, with Barry Allen seen in the background. Superman seems to exist in this world as a functioning adult(?) hero, not as “teenage Superman”/Superboy, per a statue seen in the background of one scene. The episodes are each several minutes long. The first one sets up the show’s premise (“Acme Looniversity meets Sky High”). The second episode focuses on Wonder Woman enrolling at the school and meeting the entire cast, with one of the funniest bits so far. The third episode has Diana adjusting to life with her new roommate: Harley Quinn. In this series, Bumblebee’s a student counselor, while Hawkgirl’s the hall monitor. Beast Boy behaves like his “Teen Titans” TV version, complete with the same voice artist. Barbara Gordon fans will be pleased to know she’s in this series, as a merger of her Batgirl and Oracle personas. Barbara’s operating as Batgirl (based on publicity art/toys), but isn’t a student—she works as the school’s IT person. (A default password she gives Diana is an in-joke to Barbara’s history.) It’s presumably not Diana’s first day in “Man’s World” (she’s got a smartphone), but she’s clearly still very new from some of her behavior. Some of this series might seem a bit odd to some old-school fans. The slightly awkward name “DC Super Hero Girls”? Beast Boy and Bumblebee are the same age as Harley and Diana? (Wonder how old Clark is in this world.) New 52 Harley costume/skinny Amanda because, um, New 52-anything gets points off by me by default? While this show’s a good thing, the main DCU material itself does need to be more all-ages friendly, and accommodate boys and girls. (Hiring more diverse staff will greatly help.) I also wonder why this couldn’t be a TV series instead of just a web one, though that’s the same question I have about the Vixen web-based series. Nitpicks aside, it looks like a promising animated series for young girls; the accompanying toy line also looks like it’ll be popular. (I can buy my niece a Bumblebee figure!) Hopefully it’ll appeal to kids, and make them as excited about DC’s superheroes as I was watching “Super Friends” growing up. Here’s the show’s YouTube page, which contains all of the episodes to date.